Supporters of Digital Audio Broadcasting say DAB offers better sound quality and more channels at an eighth of the cost of FM (frequency modulation) transmission, which was first launched in the US in 1945. The authorities also say DAB offers better coverage, allows listeners to catch up on programmes they have missed and makes it easier to broadcast emergency messages in times of crisis. "The big difference and the main reason behind this big technological shift is that we want to offer a better radio service to the whole population," Ole Jorgen Torvmark, the head of Digitalradio Norge, a company owned by public broadcaster NRK and commercial radio station P4. Norway, generally a technology-friendly country, has been preparing for the switchover for years—DAB and FM have existed side-by-side since 1995. There are currently 22 national digital stations, along with around 20 smaller ones. The FM spectrum has room for a maximum of only five national stations. The big switch-off begins in Nordland, in the country's north, at 11:11 am (1011 GMT) on Wednesday before expanding to the rest of the country by the end of the year, making millions of old radios obsolete. 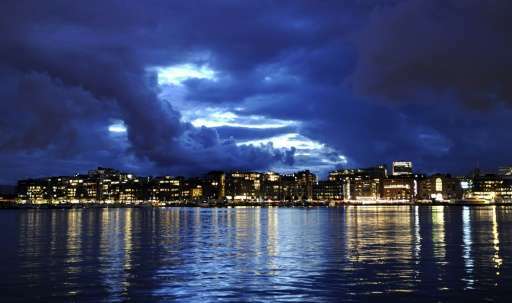 "It's completely stupid, I don't need any more channels than I've already got," Eivind Sethov, 76, told AFP in Oslo. "It's far too expensive. I'm going to wait till the price of adaptors comes down before getting one for my car." So while the switch to digital will reduce the cost of transmission for broacasters, it is listeners who will pick up much of the cost of the transition. But Torvmark insists the time is right. "It's clear that when there's a big technological change, some people ask difficult questions and are critical," but "most listeners are ready," he said. "Every week more than 2.1 million listeners—half of the listeners—listen to stations that wouldn't have existed without this technological transition." Part of the reason Norway is the first country to switch away from traditional analogue transmission is to do with topography—it is expensive to get FM signals to a small population scattered around a landscape riven with fjords and high mountains. The process will be watched closely in Europe by Switzerland, Denmark and Britain, where listeners have taken strongly to digital radio and which all plan plan to shut down FM radio broadcasts at some point in the future. The UK has not set a date but has said it will switch off the FM signal when 50 percent of all radio listening is digital—the figure is currently over 35 percent—and when the DAB signal reaches 90 percent of the population. But other countries, including France, where neither commercial nor public broadcasters have been convinced by the new technology, are lagging behind. "It's taken an awfully long time," said Simon Spanswick of the Association for International Broadcasting. "Trying to persuade the public to invest in a new radio... it's a tough ask." And some governments are naturally reluctant to upset voters by forcing them to buy new radios. Germany for example had set 2015 as the FM switch-off date, only to see it dumped by lawmakers in 2011.